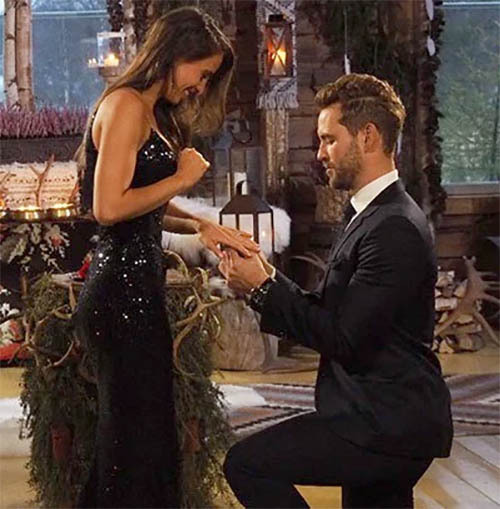 Season 21's Bachelor Nick Viall popped the question Monday night to finalist Vanessa Grimaldi with a diamond-and-platinum engagement ring valued at $100,000. Featuring a round, brilliant-cut center diamond accented with baguette diamonds and 164 smaller round diamonds, the ring boasts a diamond total weight of 3.75 carats. 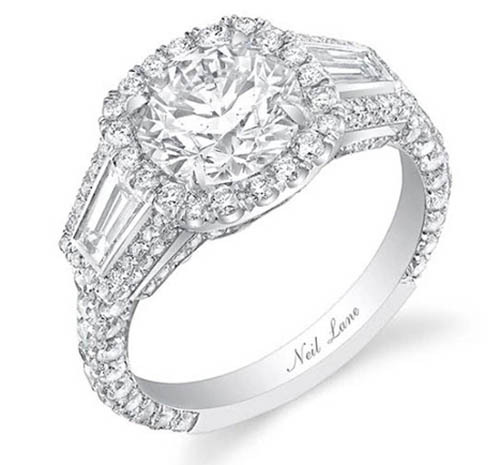 Viall chose a ring with a classic round center diamond after considering princess-cut and cushion-cut options. "It's a traditional ring with an old-fashioned feel," a jewelry-industry source told E! News. "It's got an old soul. It's classic and elegant. [Viall] chose it because that's what he thinks of her." 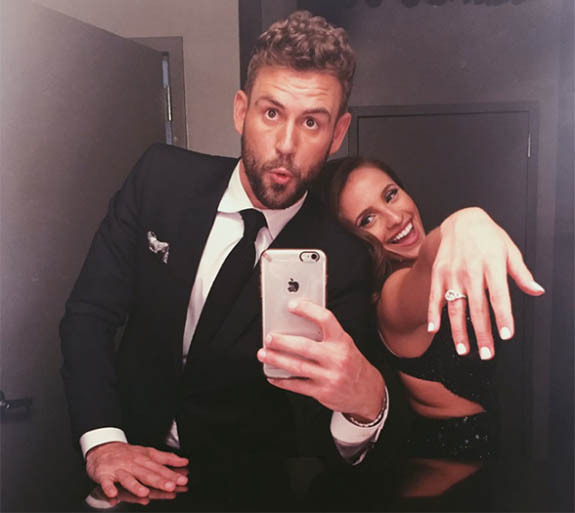 The 36-year-old Viall, a runner-up on Andi Dorfman and Kaitlyn Bristowe's seasons of The Bachelorette, as well as a fan-favorite on Bachelor in Paradise, took one more chance at finding true love during this season of The Bachelor. Viewers followed the entrepreneur's international journey, which culminated with him on bended knee, choosing Grimaldi over fan favorite, Raven Gates. "So much about me being here has to do with the past," he told Grimaldi in the prelude to his proposal, "but when I look at you, all I see is my future." "It's always exciting to work with these guys to select a ring for the love of their lives, but it was maybe even a little more gratifying this time given Nick's journey," noted designer Neil Lane in statement. "He was very thoughtful in selecting the perfect ring and that's obviously a reflection of the love he has for Vanessa." Viall and special-education teacher Grimaldi, 29, were excited to share a series of post-engagement selfies on Instagram. He has 1.2 million followers and she has 752,000. Despite its impressive specifications, Grimaldi's new engagement bling is slightly smaller than that of last season's Bachelorette, JoJo Fletcher. Fans may remember that former NFL player Aaron Rodgers proposed with a platinum ring highlighted by a 3.5-carat oval-cut center stone. The band was encrusted with diamond pavé for a total weight of 4.5 carats. That ring was valued at $85,000. The two-hour season finale of The Bachelor was Monday's #1 most social program with 1.2 million interactions on Twitter and Facebook, according to Nielsen figures provided by ABC. The Bachelor has been drawing more than 7 million viewers each week and ratings were up 11% from last season among adults 18-49 and up 15% in adults 18-34. Each engagement ring on The Bachelor contractually belongs to the show, according to Radar Online. If the engagement doesn't work out, the ring may be claimed by the show's producers. Credits: Proposal and rose ceremony screen captures via ABC; Ring photo courtesy of Neil Lane; Selfie via Instagram/Nick Viall.